Teamup user accounts provide a central place for accessing all your Teamup calendars, both those you created and those that have been shared with you. Once you create a user account, you can log in and view your Teamup calendars in your calendar dashboard. You can also set up and manage event reminders from your user account. 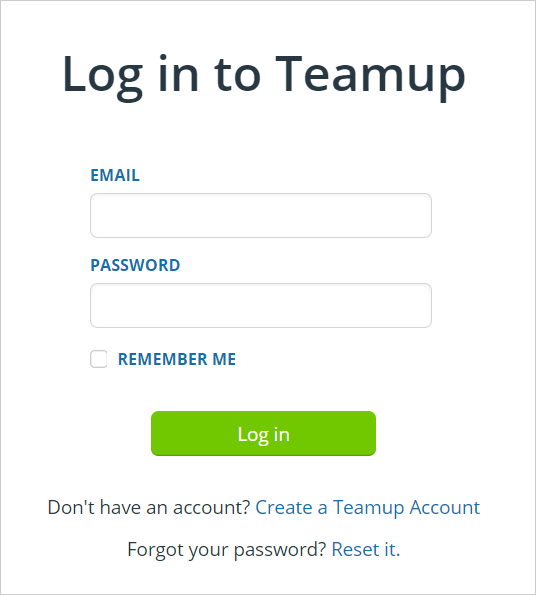 The login screen for a Teamup user account. Anyone can create a Teamup user account. User accounts are optional; all Teamup calendars will still function in the same way, whether or not you choose to create a Teamup user account. You can access your calendar as usual via your calendar link without logging in to a user account. Optionally, you can add your calendar link to the dashboard of your user account for quick access. If you don’t have a Teamup user account yet, you can create one.